Bill Bowerman was a running coach, a thinker and a man of vision. In 1971 he co-founded Nike. Bowerman JAOO IT-Run is co-sponsored by Nike. Software Engineers, Project Managers - a lot of us - exercise too little. JAOO would like to make a difference and therefore we are organizing the Bowerman JAOO IT-Run for the fourth time. Whether you are a regular runner or have to start from scratch we hope that a lot of participants will take the challenge and join the run. See it as a chance to get in shape both for your personal well-being and to prevent injuries from working long term with computers. The JAOO Run is organized by EOS, Aarhus 1900, and Nike. Aarhus 1900 is one of the biggest sport clubs in Denmark and is each year the organizer of a lot of different sport events in Aarhus. 15.- EUR (110.- DKK) per person. 40.- EUR (300.- DKK) with teams of 3 persons. If you attend JAOO 2005 the JAOO IT-Run registration is free, please register when you register for the conference. Online. Payment can be done by credit card or invoice. You can run either as individual or in teams of 3 runners. The teams are IT-Teams and teams. Individuals and teams run at the same time. IT-Teams run 5 minutes before. The JAOO IT-Run takes place September 27 2005. Start and end at Ridehuset (next to the conference area). Your Nike T-shirt is your start number. T-shirts can be picked up before the run at Sportmaster, Frederiksgade 32, from September 20 to September 24. 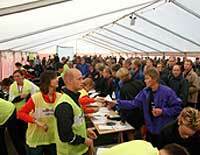 If you register later than September 21 pick up your T-Shirt 1½ hour before the start in Ridehuset.